All photos mine, taken with iPhone 6. Autumn has descended upon us virtually overnight with her reds and yellows, browns and orange leaves among the green. The garden is on its last legs, the tomatoes picked and sitting on the windowsill to ripen. Only the exuberant parsley and leggy basil remain. I’ve filled jars with both to enjoy their green abundance and aroma, and to make picking a few leaves here and there a breeze. 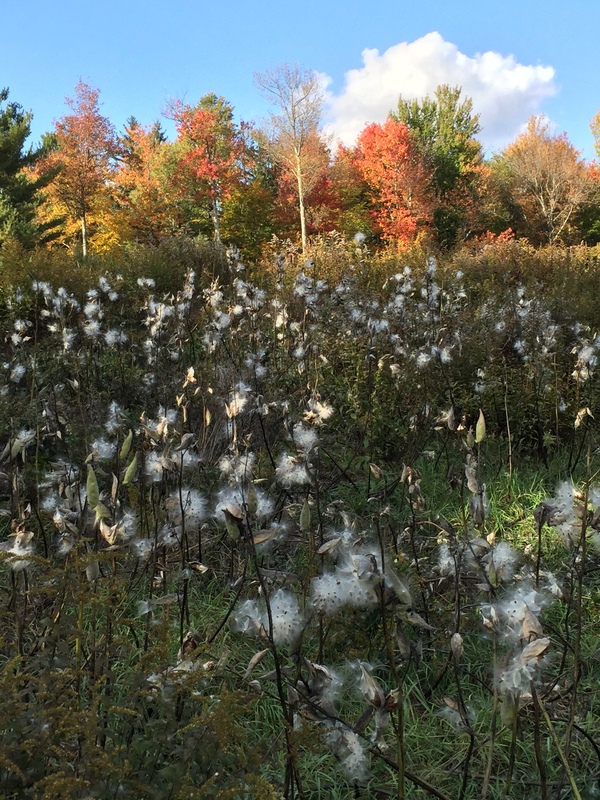 On my way back from our community garden the other day I came upon a field of milkweed, their snowy fluff catching my eye among the greens and autumn colors. 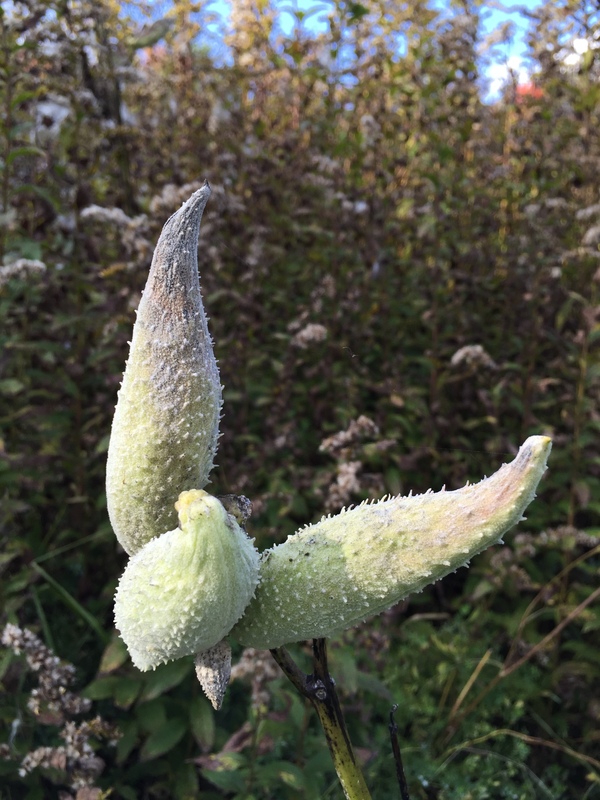 I knew little about milkweed (Asclepius syriaca), mostly that the sap of the immature pod is white and milky in appearance. I just referred to Wikipedia on the subject and read that monarch butterfly larvae feed solely on milkweed and therefore monarch populations in a given area depend upon the abundance of milkweed plants within it. The silky floss is so soft to the touch, even with the flat brown seeds to which it is attached. As I approached the field, I saw bits of fluff in the air. Up here on the Pocono Plateau milkweed is ubiquitous, on the roadsides and in fields. The ones pictured here grow along a leachfield for the community’s water management. And now I know why several varieties of monarchs are so abundant here as well! How interesting it is to me that humans have found little use for these plants, despite considerable effort to eat the green pod, use the sap or exploit their floss and wood fibers for industry. The Wikipedia article says that Euell Gibbons found a way to eat them and that native Americans have used their fiber for textiles. The miracle of nature is so present here in this amazing plant. A particular species of insect, the monarch butterfly, relies on this particular plant family for its survival. The flowers are pollinated by a variety of insects, and when the dried pods split open the wind catches and elevates the fluff and makes sure the seeds scatter far and wide. Mindfulness practice trains us to see and explore all that we encounter for its purpose and intent. We do not always understand what we see, but as nature unfolds before us and we are fortunate enough to learn about it, the world makes more sense to us. 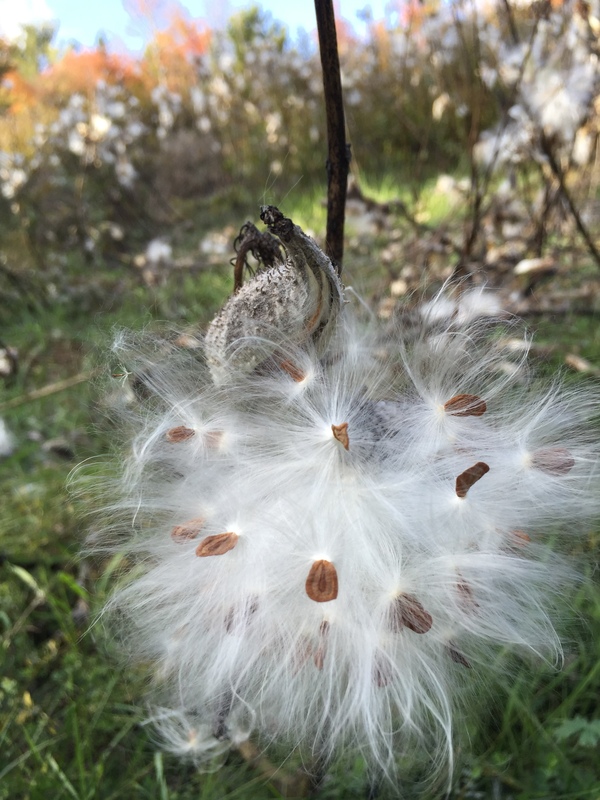 The milkweed, a plant of no remarkable beauty until fall, with its knobby pods, serves a vital role in the ecology of our planet. Having met and savored its beauty up close this week, I will never take it for granted in same way again. Thanks so much, Val! It’s so nice to always have a camera at hand. I have a good “real” camera but rarely use it. 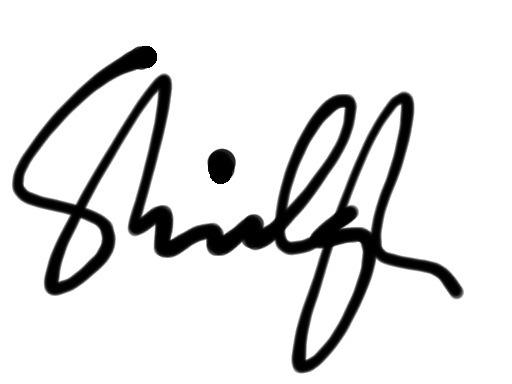 Very nice writing. We have here huge Milkweed plants, but they are more tropical. I read Jamaicans stuff pillows with the silky fibers. Thank you, Maria, coming from an expert botanical writer and professional photographer, your positive comment means a lot! That’s interesting about using milkweed fluff to stuff pillows. Maybe I heard that somewhere, because I used to think that kapok came from milkweed pods until I learned there was a kapok tree, a tropical tree that also produces cottony fluff used to stuff pillows and life jackets. Nature is always a wonderful Miracle and I am never disappointed to see such wonder that Nature produces.. Thank you so much for sharing the Milkweed and her beauty with us.. The photo’s are wonderful And I use my mobile phone to take most of my own images 🙂 when out and about.. Thank you, Sue. I just saw your comment. I appreciate you stopping by. 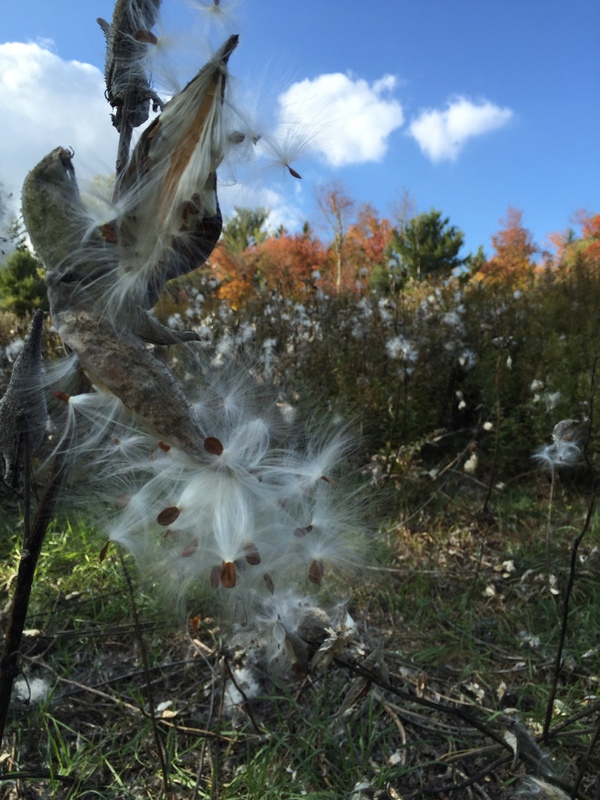 By the way, it’s milkweed season again!